Well over a year ago, while I was pregnant with Hank we looked at some preschools for Goldie. I did this as part of the transition process when she turned 3. I didn't see a place that I loved, so we decided to utilize some community programs this year and revisit the preschool options when she was turning 4. I began my search anew in February when I saw that a Montessori school was having an open house. It was nice, but it seemed like there would be a lot of rules for Goldie to remember and the room had a lot of furniture for her to navigate around. Goldie also learns best in an environment that is free of visual clutter. I spoke with the teacher and explained what Goldie's strengths and weaknesses were. I did not tell her my daughter has Down syndrome. In my experience, it brings up too many stereotypes. The school's only tuition option was for 5 days a week, so I decided to keep looking. It would cost us a fortune in gas to make 10 trips a week! My next call was to my neighbor. Her kids went to a Montessori school that was 5 minutes away, but only advertises by word-of-mouth. She was happy to call the owner and talk to her about Goldie. The owner, Miss M, has really exceeded all of my expectations. She has met Goldie one-on-one twice and has had me observe the classroom one morning by myself. Before I sat in on a class, she told me "I don't want you to get overwhelmed and think that Goldie can't do this, because she CAN." Miss M. has asked me to bring Goldie once a week for 1/2 just to get her used to the classroom and allow them to get to know her. I must have looked a little nervous because she assured me that Goldie will be going to school there as long is that is what I want. The plan right now is for Goldie to attend two mornings a week in the fall and maybe add a third day after the Christmas break. A couple months ago I was asking myself, "Am I crazy to think that my child with Down syndrome can go to a typical preschool without an IEP and supports?". But, after seeing Goldie in the classroom and feeling the kindness of the students and teachers, I know Goldie will just blossom at school next year. She is already requesting "school" on a daily basis. This is my first post using a blogging app. If it works out, I may be able to post more often than once a month! If you would have told me 4 years ago that I would be medicating my child to treat ADHD I would have scoffed and presented you with a bottle of fish oil. Just one of many alternative treatments for attention deficit disorders. I have the Down syndrome to thank for keeping me humble and teaching me that I don't know as much as I'd like to think I do. I'm sure other parents of children with Down syndrome wonder if their child's attention span is typical of a child with developmental delays or has it gone into the realm of ADD/ADHD. I'm not a medical expert, but I can tell you how we made that determination. In September (Goldie was 3 1/2) I noticed that I was redirecting her towards acceptable activities every couple of minutes. In addition to the redirection and positive reinforcement, we also started explaining consequences and using time-outs. Goldie responded very well, but it illuminated the fact that the problem was not behavioral. Even when I was sitting on the floor playing with her, she wasn't able to stick with an activity for more than 2 minutes. My next thought was that the problem was developmental. Was I expecting too much from her? Were her developmental delays responsible for her lack of focus? I did what all mothers do and began comparing her to my other children at that age. My oldest could sit and listen to me read all day at the age of two. Daughter number two couldn't sit through anything longer than a board book until she was 5 and would not watch t.v. until she was 4. Yet, she could still stay on task longer than Goldie. Which brings us to Hank. At 15 months he will sit and play with a toy for 3-10 minutes. During this time I happened to be talking with a friend who has a daughter with DS that is a year older than Goldie. We both agreed that our children needed help choosing an activity, but in Goldie's case it would only keep her occupied for 2 minutes. Times like these are when I wish I was active in a real life DS support group so that I could have more exposure to other children. For as long as I can remember, I kept telling myself, that when Goldie's vision and fine motor skills improved she would be able to sit and play. Her vision improved tremendously and she is able to do many things, but her ability to focus on an activity never improved. As she grows we see her making progress in so many areas. Attention has just not been one of them. After implementing a list of alternative remedies as long as my arm and finding no relief I placed calls to Goldie's pediatrician, the Psychology department and the Down Syndrome Center at Pittsburgh Children's Hospital. The DS center was very helpful. One of the first things they asked was for Goldie's evaluation scores from her IEP. I know most of us don't like these evaluations, but I was glad to see that the scores were useful to ME for once. In most areas Goldie had a 25% or less delay. Except in Attention and Memory where she had a 50% delay. The final step was having her therapists complete evaluation forms for the Down Syndrome Center. I recieved my own parent survey to fill out. The results? In her doctor's words "She is off the charts for ADHD. I am surprised she is as well behaved as she is. I expected her to be all over the place." (Thanks go to the iPad for keeping Goldie seated. She must have gone through 10 different apps in just as many minutes.) He pointed to the chart and showed me the range in which children with DS normally fall and the range in which Goldie was. We discussed treatment options and possible interactions between Goldie's supplements and medications. Later, I received a large packet in the mail on Down syndrome and ADHD. What I've read so far has been both disturbing and helpful. I'm sure your wondering how the things are going with the medication. While I worry tremendously about the long term consequences and side effects, right now things are much better. Goldie has not had any negative side effects from the medication and I feel like it has bought us some time to continue exploring other treatments. If you are looking for more information here is a link to get you started. http://www.riverbendds.org/index.htm Click on Medical Series, then ADHD. Kindergarten.com is offering all of their ABA apps free for the month of April in honor of Autism Awareness Month. I was actually going to purchase some this week after hearing about them over at Unringing the Bell. Really, I bought an iTunes card at the grocery store this weekend so I could get my fuel discount. Glad I didn't have time to use it! FYI: The ones listed under the heading Flashcards were always free and the rest of them were 99 cents. I would recommend the receptive language ones and I downloaded the Action Flashcards for Goldie because verbs are something she has been working on in speech. 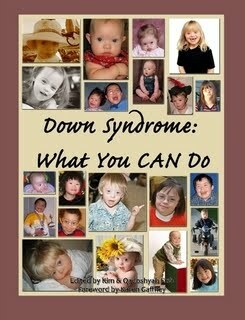 Just a reminder that Monday, March 21st is World Down Syndrome Day. March 21st was also my due date when I was pregnant with Goldie. I guess she didn't want to be defined by her diagnosis since she chose to make her entrance ten days sooner! Here is a link to the events going on in the United States on 3/21. TalkTools is offering 40% off of their self-study dvds. I've also heard that if you call these dvds are available to parents for 50% off. Wish I had known that! If you are looking at the Down Syndrome Population dvd, mine is for sale. I have the CEU paperwork to go with it, as Goldie's therapists didn't need it. Just leave a comment or send me an email. If you don't already have this awesome book now is the time to get it with free shipping until 3/21. Go here and use code GROUND305. I won a copy back in December and have referred to it numerous times since then. It is all the research I've been finding here and there, plus some a whole lot more, put together in one easy to use book. Just today I was ready the articles on Neurodevelopmental Therapy. This book is so positive and comprehensive; I wish it had been available when Goldie was born. One thing I've learned is that Goldie is not a performer. She does not like to be tested on what she knows. A couple nights ago, Goldie got out her alphabet letters, so I grabbed the camcorder on the off chance that she would show off for me. I got lucky! Her are a couple videos of her identifying the letters of the alphabet. Part 2 includes some lowercase letters. You'll notice that instead of naming a couple of the vowels she tells me what sound they make. Warning: the lighting is poor, her pajamas mismatched and the slip cover for our couch was in the laundry, but this is real life with 4 kids!